Located just off the 163rd street on the Intracoastal side of the island. 400 Sunny Isles condos for sale feature direct waterfront views, private marina, and dry docks. One of the North Miami Beach best locations, the complex is a short walk to the beach, supermarket and everything Miami has to offer. Please Contact Us or give us a CALL 786-505-4786 if you have a question on the 400 Sunny Isles Blvd Condo building. The unique location of this luxury waterfront complex on Sunny Isles Blvd sets it apart from other condo buildings in the area. A private full-service marina at your doorsteps, direct Intracoastal access with no fixed bridges. A waterfront oasis located on expansive 640 feet of direct Biscayne Bay Intracoastal, perfect for anyone with a boat! Direct unobstructed east and west views of the Intracoastal and the City skyline building offers five-star amenities with state of the art spa, activities center, tennis court, and a pool deck. 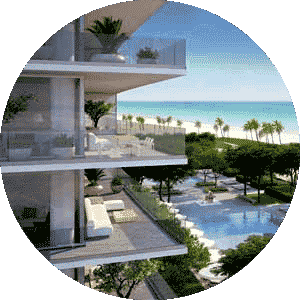 This is a prestige new condo complex offers best of both the beach and the bay. 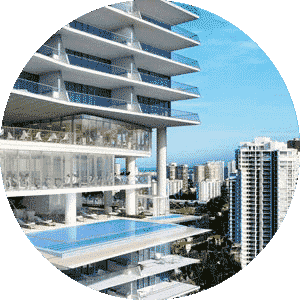 Condos for sale in 400 Sunny Isles building range in price from $700 to $1000 dollars per square foot. Two towers, each 20 stories high with a total of 230 residences in the complex. Every unit offers endless views of the Intracoastal, Oleta River and City. Open air arrival courtyard, exotic woods, tropical lush gardens and serene water features designed by Architect Chad Oppenheim and Urbanica Group blend seamlessly with your residence. Located next to the new being build Parques Towers, existing St Tropez and Oceania complex. Walk to the beach jump on the shuttle. Enjoy the new park just across the street and restaurants cafe and new stores to be built down the road. You could literally walk across the bridge to the Intracoastal Shopping Plaza with anchor supermarket Winn Dixie, TJ Maxx, other chain stores, few nice restaurants, and Imax Movie Theater. • The Sandbox, a yacht and beach club bistro with a relaxed lounge atmosphere, featuring a bayfront beach with sand floors, a sunset pool, and cabana. 400 Sunny Isles Condo Bldg.